24 years ago I was so very lucky to have the stalk that drops all babies at parents door stops - that's how it happens right? - drop me off to my mum. 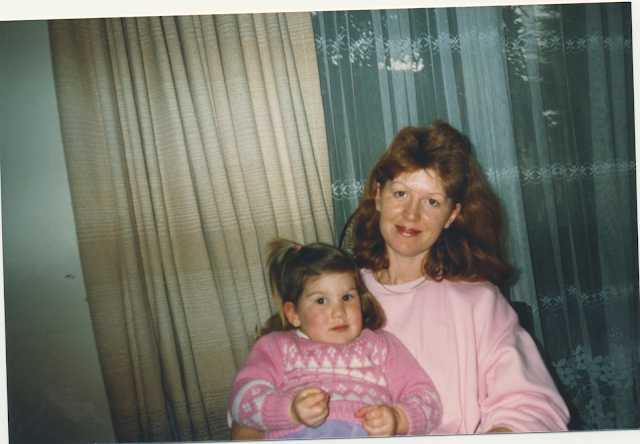 I have, for 24 years, had the world’s best mum teaching me all there is to know about the world, the good and the bad. She has taught me about love, about honour, about values, about strength, and supported me un conditionally. I remember growing up I used to say I wanted to be a cop – until I realised I was scared of the dark & didn’t want to work on Christmas – then a ballerina, then I was going to own a hotel! But no matter what or who I wanted to be she supported me, got excited for me and would talk about just how I was going to do it. There was no words of doubt, no negativity, just unconditional love and support. Mum always says we’re nothing alike – she’s introvert and very shy, and I’m extrovert and well, not shy, but what she doesn’t realise is just how alike we really are and how much I aspire to be as kind spirited and loving as she is. Of course like any mother / daughter relationship there are fights and disagreements but that's what makes us mother and daughter. So for Mothers day which we just celebrated May 13th I wanted to honour mum by saying thanks in such a public arena. So thanks. Thanks for the sacrifices you've made for me and the family, for the unconditional love & support we've always been shown, for the nicknames I still cherish as kids like treasure and pumpkin, for making life seem safe & normal when really it was falling apart, thanks for teaching me strength and being a role model when it came to sticking up for yourself when it was right and for bringing me up to be an independant woman. But most of all thank you for being who you are - with all your incredible lessons you have taught us and memories you have created for us. Happy belated Mothers day mum - you're a treasured gem that we'd be lost without. Awww, this is such a beautiful post, your mum must be so excited! A tear almost fell down while I read these words because I think we can all relate to how amazing and special mums are. Such a beautiful tribute to your mum, Anna. We all love our mums in such a uniquely possessive way it's just beautiful to see someone else feel the same way about the one person in the world that loved them before anyone else got around to it. What a sweet picture and nice post! oh so lovely and tender post! I just wanted to tell you a special thank you for the loveliest comment, it really made my day, my week, heck, it made my year! you are too sweet!